This is a full-size single urn and is designed to hold the cremains of a person having a total body weight of up to 220 pounds prior to cremation. 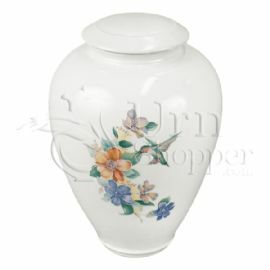 The Tivoli II porcelain cremation urn is crafted in the shape of a classic style vase with a garden hummingbird design. Porcelain is a ceramic material made by heating raw materials, usually clay, in a kiln. Porcelain derives its name from the Italian word, porcellana. Porcelain has often been referred to as "china" because it is believed that China was the birthplace of the material we know today as porcelain. Because porcelain cremation urns are often created, or thrown, by hand, please allow for slight variations in color, texture, and size. Porcelain urns can be kept at home, entombed in a cemetery columbarium niche or buried in an earth grave. Please note some cemetery regulations may require that this urn be placed inside of an urn vault prior to earth burial.